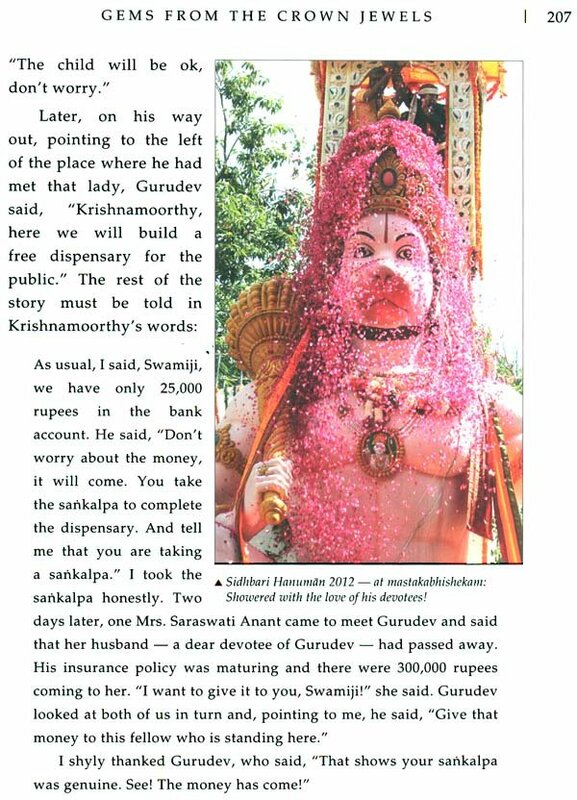 When the Rewa Pitamaha Sadan was being planned, Gurudev declared, “We shall build a Sri Rama Temple-and that will be Vanvasi Rama! Why the forest-dwelling Vanvasi Rama? “It’s easier to serve a Vanvasi Rama than Raja Rama,” Said Gurudev. As He entered his forest exile, Vanvasi Rama was cheerful and supremely indifferent to circumstance. His indifference was born of equanimity, an aspect of vanaprastha vrtti. He had neither rejoiced on hearing of his coronation nor grieved on being exiled. He adopted the forest, ate roots, slept on the hard ground, delighted in whatever was offered to him, had satsanga with rsis and protected their yajnas. Unintrusive, loving and gentle, wherever Sri Rama went, that place became enriched. Such a Vanvasi Rama stands for all the vrttis (through patterns) that a vanaprasthi direly needs to cultivate. And, Rewa is just 125 kilometers from Chitrakoot, where Sri Rama lived for a great part of His Fourteen years’ Exile ! We have to learn the art of living, but alongside we need to learn the art of leaving. That is the focus of the stage of life called vanaprastha. Today, old age has become synonymous with ailments, loneliness, and complaints. All three result from attachment to the body, to relationships, and to the ego, respectively. So endemic is this attachment that, even at the onset of age sixty, some begin to feel illness creeping up on them, they feel they have become prone to being unwell, and they even imagine that they are losing their memory! This is because of their fear and their image of old age. Gurudev initiated the vanaprastha movement in the 1980s and it evolved into the Chinmaya Vanaprastha Sans than (CVS). The reason Chinmaya Mission started the CVS was to clarify that the age after grhasthasrama is the age to turn inward. Thus, CVS is meant for guiding senior citizens toward the very goal of their life called Self- realization - to declare, "enough of all worldly pursuits!" Every pursuit has a context: Vanaprastha is when the material context is over. In olden days, estimating the life span of a person to be one hundred years, one's life was divided into four quarters. In the first quarter, called brahmacarya, life was dedicated to discipline and studies. After getting married, for the next twenty-five years, the person led a householder's life in the grhasthasrama, enriching the society. When a person turned fifty, one started preparations for vanaprastha, Thus, by seventy-five years of age, the person became detached enough to renounce all and take sannyasa. However, in the twenty-first century, some people begin their married life only when they are in their mid-thirties. As a result of delayed grhasthasrama, when they reach the stage of vanaprastha they are yet householders and worrying about retirement, settling their children, and so on. As a result, their vanaprastha years are spent in endless worrying, almost never thinking of their self-development. Everything, every investment, is to be left behind on the earthly plane. Even the body will be left here. We will take with us only knowledge and the dharma that we did. Our good and bad karmas, too, will go with us; whatever meritorious practices such as nama sankirtanam, japa we have done, only those will go with us. We should take care of the body, no doubt, but we must not get obsessed with it. So Vanaprasthan Sansthan is really meant to guide the senior members of society toward what they need to work on after they attain the age of sixty. By then, with all duties done, it is time to turn the mind toward Self-realization. And, age gracefully! Aging gracefully is when we do what is prescribed for the age. In childhood, students should remain devoted to studies, to knowledge; this is siksa. In youth, to their vocation or profession, to serving people with some vow; this is called diksa. And in old age, the attitude to adopt is bhiksa - being content with whatever life gives you. No more worldly ambitions. What is graceless aging? When every stage of life is wasted in attachment and worldly indulgence, and when old age is spent in mere worrying with never a thought of God; then life speeds past gracelessly. Vanaprastha is the period of inquiry, of turning toward God. It is how one should age. It is the path of graceful aging. 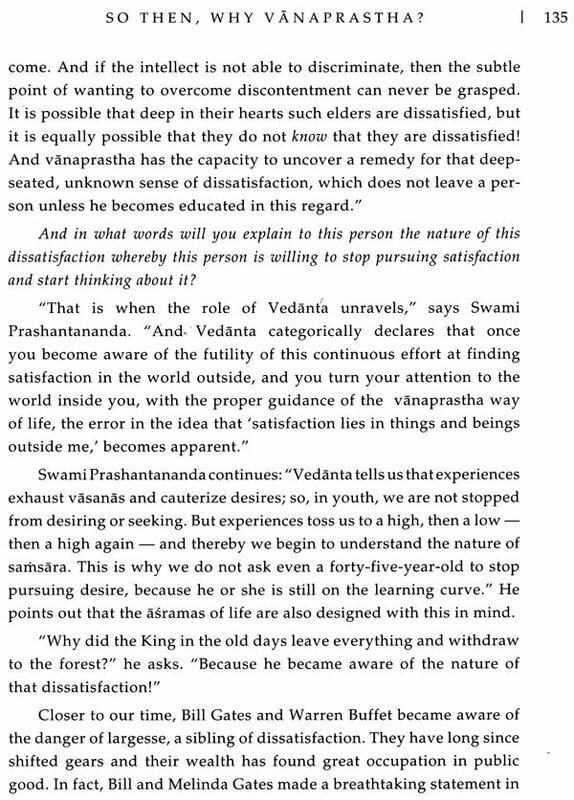 Vanaprastha is not the age of helplessness. Elders can take care of themselves and others, too! They have not arrived into uselessness. They have arrived into becoming supportive of and useful to society. Aging is not decaying; aging means maturing for the inward journey. So it is, in fact, the age of non-dependency on things, on beings, and on the ego. It is the birth into empowerment. This is called the art of leaving -leaving the world of dependency on objects and relationships. Bhagavan Sankaracarya says that even though the sastras have prescribed many methods of penance to achieve detachment, they are not necessary if you are given to the study of scriptures. With reflection on That, meditation on That, and practice of That, you don't have to do many kinds of severe penance. Remain steadfast in That. The one who has become freed from this elation, depression, and intolerance, freed from life's emotional rollercoaster, freed from the attack of the body, freed of fanaticism at the intellectual level, and freed of the preferences for comfort - that person is a vanaprasthi. Thus arrive into a life of withdrawal from all worldly occupations and preoccupations and turn the mind's attention to the higher goal. Vanaprastha is the age of resilience. Don't delve into the past or worry about the future. Just continue and be, and remain steadfast in the pursuit of spiritual knowledge. We are a vast world of people grouped by geographies and consequent culture. Hence we eat different things or the same things differently. We wear different clothes, we talk different languages or the same language differently, we pray to different gods or the same God differently. We are subject to different economies that determine different outcomes for us. We have different leaders who approach similar problems differently. In short, we are all the same people, but thinking the same thoughts differently. Vanaprastha is a thought that most of us have in almost every country, albeit differently. Consequently, people all over the globe arrive at the same age of sixty-five to seventy - but differently. Some societies call the ones who are sixty-five or older, elders, some call them aged, some call them third agers, some call them budhaoo, some call them vrddha. We also treat them differently: some depend on them, some exclude them, some disengage from them, and some classify them among the needy and weak. Some reach out to them selectively, as, for instance, to sell insurance. But vanaprastha does not concern itself with what people think of age. Vanaprastha thinks of the individual, regardless of the culture the person belongs to. Once vanaprastha is entered, culture and country of origin cease to have relevance. Thus, it is a great equalizer. With this in mind, welcome to Vanaprastha, A Joyful Journey Toward Realization. When Bill Gates 'retired' from Microsoft in 2008, he shifted focus and devoted his mind to using the Bill and Melinda Gates Foundation to fight crippling diseases that derail economies and destroy lives, like malaria, HIV / AIDS, and more recently, polio. He focused on the poorest of poor nations, on health, on education, on sanitation, on agriculture, on poverty, on hunger and malnutrition. Gates also invested in innovation in agriculture, education, sanitation, and in techniques to reverse global warming. Lokasangraha (world welfare) at its best, without a doubt. But there was something else he did; while most Pursue golf with a vengeance after retirement, Gates hung up his golf clubs. He said: ''It takes up too much time to get any good at it." Gates was rearranging his life. In his own way, he was entering vanaprastha. He decided to devote himself to philanthropy, to saving lives, to putting his wealth into the world in a way that would have a multiplier effect. He would eradicate disease. What was to be had by excelling in golf? That time was up. The Gates couple, like many of us, had thought that their time for philanthropy would come after age sixty. But their passion for and awareness of global issues began far, far before that, simultaneously with a realization that they had no more personal use for money. Do we all have a plan for lokaseva (service to the world)? When Gurudev came down from the hills, he had a plan - to take Vedanta into as many hearts he could. One part of that plan - to resurrect society spiritually - was 'vanaprastha' for those who had graduated from a householder life. This resource pool would resurrect society. 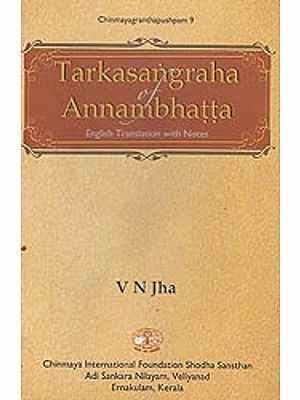 When we read the stories in this book, it might appear that the vanaprastha movement in the Mission began without a warning. And that is true. It did begin without a warning. But it began with a sound intention and a plan that germinated in Gurudev's mind. This book details the gradual unfolding of that plan and how it bloomed. Some chapters in this book are devoted to examining some research papers that were discussed at a national workshop and some at a national seminar. There is also a whole chapter that goes into the numbers surrounding demographics, population estimates, and projections. These, in fact, are an outcome of Gurudev's initial push to his devotees to pay attention to elders. It has been pointed out twice in this book that Gurudev merely sowed the seed but not once did he say how the fruit should look. That, he knew would be the responsibility of the seed. So the researches and papers that have been written for these workshops and seminars are to be seen as emanating from that same seed. And together, all these define the dimensions of eldercare that Gurudev wished for us to invest in. At the level of the individual, it is vanaprastha: at the level of the collective Mission, it is eldercare. In 1981, when it began, the vanaprastha movement was most visible in the Chinmaya Mission centers in India, where industrialization, followed by the breakdown of the joint family, followed by rampant neglect of elders, necessitated eldercare. But on closer examination, the diagnosis also revealed that the rot had spread; there was a gradual distancing from spirituality, in some cases starting as early as in school, where even the basic accent on moral values had been replaced by an over-emphasis on performance, material rewards, leading on to material success. Soon the young were displaying an extraordinary indifference, nay, callousness, toward spirituality and religious philosophy. Much of the Chinmaya Vanaprastha Sansthan (CVS) initiative that began in 1981, was India-centric, with research drawn from the West. The West had experienced its own problems with an aging population. There, old age tended to be defined as a state of cognitive and physical decline, resulting in labeling the elder as a burden, a liability. But India that was already overburdened by population, deficits and debts, the growing elder population was bad news. In this din, the words of its roots and rsis, were thus lost. Barely a few knew that vanaprastha is the age of the ascent of man, that societies were nourished by vanaprasthis. All this means we have an elder population that is marginalized, but growing! When we look at the year 2050 and the 437 million billowing elder population (including a vast majority of the readers of this book), the question is, will this 437 million be scaffolded by systems that ensure care, or will the older population be an abandoned statistic, however huge? Whatever the statistics say, the fact still remains that we have no plan for human beings after their sixtieth year. This really is at the heart of the problem of why the elderly community in India, is a neglected, uncared-for lot. There is no plan whatsoever, nay, not even a thought. And the elder? He arrives at sixty-five, unprepared and confused, and is pinned with a label 'Old.' Not just in India, but even in the much coveted Western world, the elder feels marginalized. Medical care is supremely unaffordable even if available. He also finds himself useless thanks to an acute performance orientation that looks at him as an unproductive resource, an orientation that recognizes only gross gains, having failed abysmally to recognize the softer, the subtler benefits. Whereas, Gurudev has sought to show us that every society needs the elder to protect its values. The religious antagonism of the last two millenia have pushed aside the work of great masters and saints. India lost the teachings of the great rsis who in the past had trained great kings and scholars to know when their pursuit of ambition stops and when one should turn inward. Kings of yore felt the onset of dispassion early in life, and they often handed over power to their young princes, and made off to the forest to reflect and renew. The loss of vanaprastha, and the consequent despondency, has resulted in a society without any inheritance. If the elder does not know his duty, the youth, too, do not know their rights - their right to a well-built society, pruned by the elders, but only if societies perform their duties to the elders. 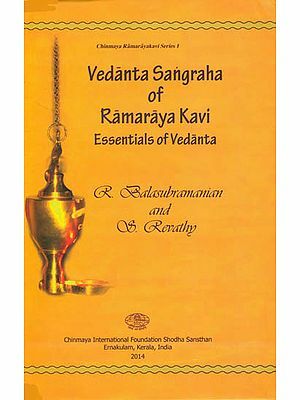 Each one of us who is reading this book is lucky to have known, or read about, a Mahatma named Swami Chinmayananda, who spent his life building a path for us to walk on, giving us a scientific understanding of Vedanta. 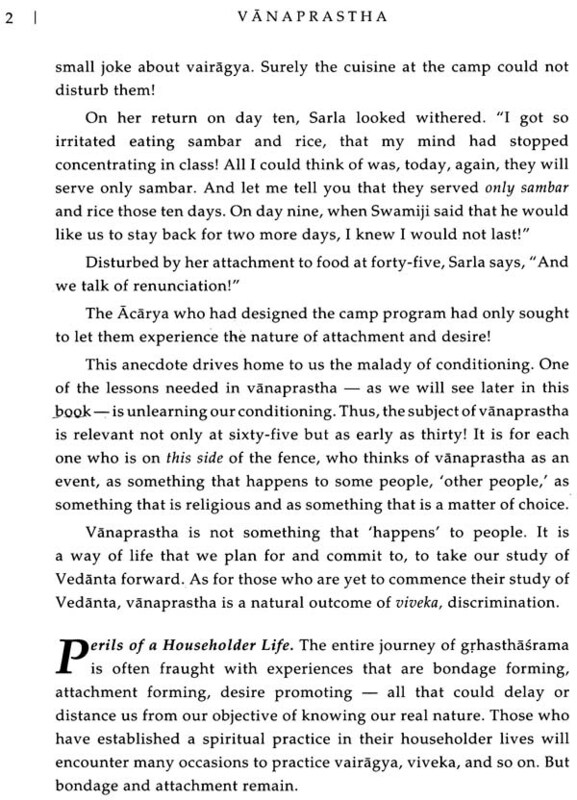 And one of the many marvelous things he did was modernize and revive vanaprastha as a way of life that will put the individual back on the road toward spiritual fulfillment from where he had strayed, strayed because he thought life ended with grhasthasrama, the householder's life. Instead, Gurudev asked, “And who will spiritually resurrect society?" For in the resurrection of society lay the resurrection of man. And this was the role Gurudev conferred upon the elders. There are innumerable ways in which the elders serve. Some teach, some counsel, some chant, and some pray for world welfare. In the course of this book, the reader will meet many elders who have found a way forward, a path graced with spiritual yearning, inner fulfillment and readiness to be guided by the Guru. What does this do for society? Read on. Sri Adi Sankaracarya no doubt took sannyasa at a very young age, and his sacrifice was tremendous. Indeed, Sri Sankara’s Mother Aryamba's sacrifice was even greater, for she gave up her life support! When Lakshmana of the Ramayana went to bid his mother farewell before leaving for the forest, his mother Sumitra steeled her heart and told him, "Go! Sita is your mother now!" Guruji says in his lectures, "What mother will give up her motherhood to another?" 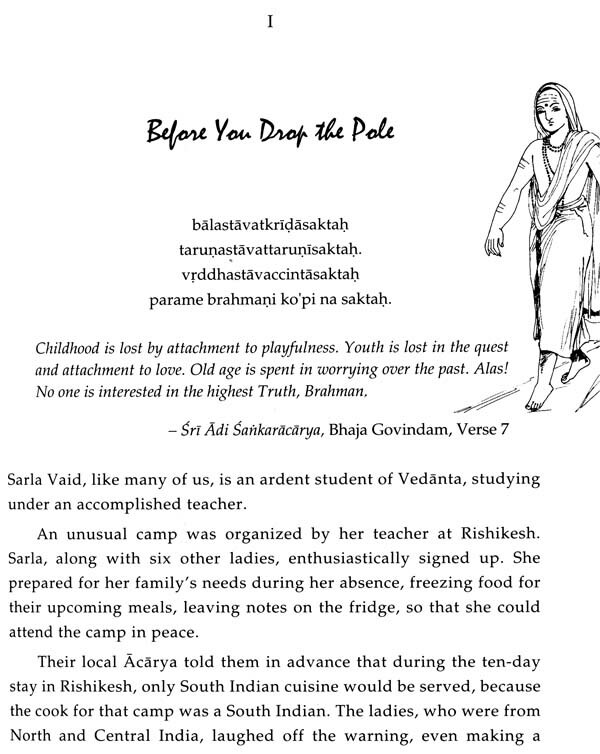 Sumitra's sacrifice helped Sri Rama’s yajna, Aryamba's sacrifice gave us Advaita. The saints and swamis in our midst are the fruit of the sacrifices made by many a parent and grandparent. This book features two such elders, Sri W. K. Govindraj, father of our Swami Dheerananda, CM Washington, D.C., and Sri Yashwant Tarkas, the grandfather of our Swami Swatmananda, Acarya, CM Mumbai. Lives of purity and tapas such as theirs are what come back as fruit that nourishes the Chinmaya Mission and fortify our societies. This is how vanaprastha resurrects society. 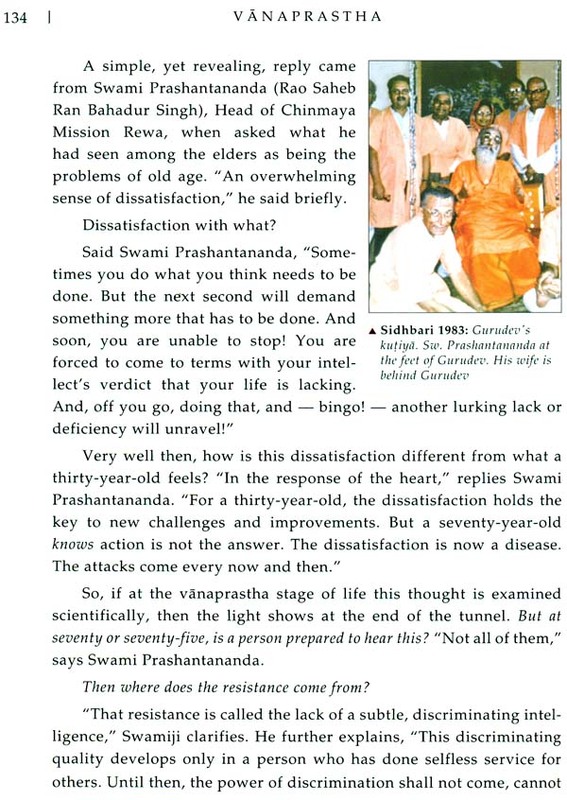 Gurudev's mission with Advaita began in 1951 when most of us were not even born. Many of those who worked for him, to establish this Mission, so that five decades later we would have his teachings to nourish us, are today above seventy-five and standing tall and strong, fortified by his teachings. 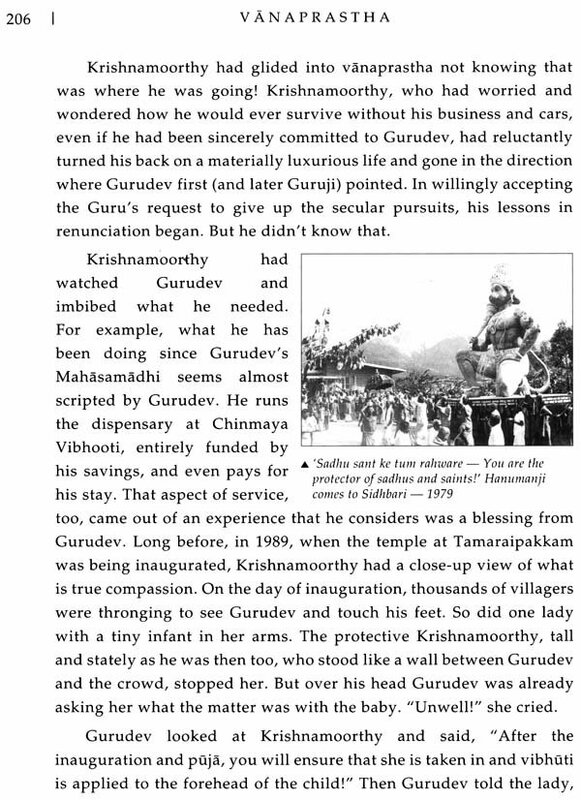 Many of them have seamlessly slid into vanaprastha, like Dr. P. Geervani, like Kshama Metre, like Krishnamoorthy Thatha, like Rudite Emir - silently tilling the ground that Gurudev had walked. We have a duty toward them. Why did they not choose to live happily ever after in grhasthasrama? Why this vanaprastha? Primarily, it is the urging of the Guru and the scriptures, followed by a choice they made. That is the starting point. The householder life of thirty to forty odd years increases our vasanas, blurring our goal for this birth. Vanaprastha is meant for us to get in touch with our birth vision, and to do that we need to step off the play-acting we have been doing all these years and now focus on the purpose of our birth. So is vanaprastha a choice we make only in old age? Vanaprastha is the creation of unencumbered time, regardless of one's physical age. It is a time for freeing oneself from ambition-driven action as well as burdensome relationships and desires. It is a time when the jiva begins the path of unlearning his fifty to sixty years of material dependency and attachments. And for those who have been following a spiritual path, it would be enormously foolish if after studying Vedanta for thirty-odd years, one came to the threshold of life at age sixty-five and jumped off the cliff of growth into an abyss of self-abnegation. Like Guru Dronacharya, Gurudev has placed the target between the foliage in the forest and commanded that we hit the right eye of the elusive bird. To whimper and complain that our joints hurt or that our progeny pay us little attention is an insult to Gurudev's fifty years of toil. He has armed us with Vedanta: should we not complete the journey? Vanaprastha is the choice we can make.